What is an Organisation List? There are two types of Lists you can create in your Contacts module: a list of Contacts, or a list of Organisations. Exporting for creating postal mail merges. Keeping track of how well your marketing is going. All contacts with a Point Score of over 100. All contacts at organisations that have received more than 5 quotes but have not yet purchased from you. Contacts who have filled out certain lead generation forms and visited specific pages on your website. You can quickly see the power of Contact Lists – they enable you to group your contacts into similar bands which you can then send highly targeted and segmented marketing to. Want to reignite the interest of contacts who have not bought from you in 6 months? Want to offer a discount to your very best customers? All are easily achievable with Contact Lists. An Organisation List, again, is a list of Organisations you have grouped together to identify as having similarities, which you are able to export. All Organisations in a certain region. All Organisations that have purchased from you more than 5 times. All Organisations that have not yet ordered a certain product or service from you. Go to your Contacts module then select the Lists item in the dropdown. You'll then be fired over to the Contacts and Organisations Lists page. 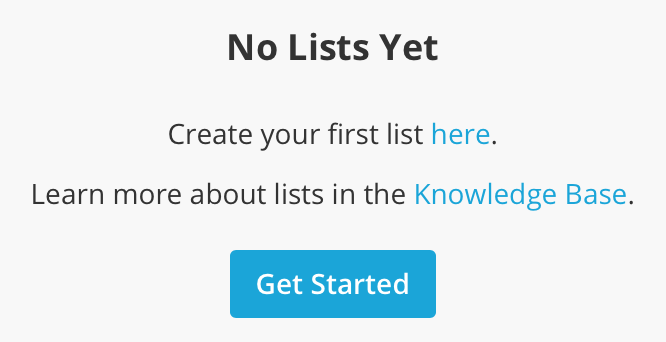 If you don't have any Lists yet you'll see a Get Started button. If you already have some Lists you'll see them listed. Click the Get Started button and you'll be fired across to the Contacts List Builder Wizard. Give your List a Name, a Description if you like, and choose whether this will be a list of Contacts or Organisations. "All Contacts with a name like John Smith"
"All Organisations that have spent over £1500″. This tells Campus whether your statement is based on the attributes of the contacts, or the organisations they work at. The important factor you're basing your statement on. E.g. "Number of Sales" / "Postcode" / "Opened Marketing Emails". The parameters of your statement. E.g. "is equal to" / "is more than" / "contains the word" / "before". A number or text string. E.g "1000" / "GL20 8GD" / "About Us Page"
Really, the best way of getting to grips with building statements is simply to build them – have a play around, you can easily delete a list once you've created it – you won't break anything. You'll probably notice there is a + button to the right of the statement row(s). This adds a new statement for you in the List Builder and tells Campus that you want to build a list of contacts based on your first statement AND another statement. For example if you wanted a list of contacts who have visited your About page AND who have also spent more than $2000 you would use the + button to create a double statement that looks like this. The other button of note, the Add an 'OR' statement sits underneath the statement row(s). This adds a whole new set of statements for you in the List Builder and tells Campus that you want to build a list of Contacts based on your first set of statements OR another set of statements. For example if you wanted a list of Contacts who have visited your About page AND who have also spent more than £2000 OR who work at an Organisation in South West London and are Head of Year 7 then your statements would look like this. As you can imagine you can get ultra-selective with your Contact List Builder statements and the possibilities are endless. By using it you'll be able to market your products and services in the smartest way, at the smartest time, to the right demographic of contacts. The great thing about your CRM Lists is that they will automatically update for you. Let's say for example you've built a list of all Contacts who have visited the Pricing Page of your website; as more and more of your Contacts visit your Pricing Page they get added to that list for you. It means that you only need to create a list once and it will dynamically update for you. Simply go to your Lists page and you'll see each of your lists. You'll also be able to see a List Count column which shows the number of contacts/organisations in that list. To refresh this count, simply click on the refresh button for that list. If you want to remove a Contact or Organisation from your list for any reason simply click on the list's name to show all the Contacts/Organisations in the list. You'll notice a trash can button against each. Simply click it and the Contact/Organisation will be removed from your list. Note, this will not delete your Contact from Campus – it will just remove them from that particular list. Every Contact List you build is available immediately for you over in the email marketing module as a list that you can send to. You are also able to export your Contact/Organisation Lists. Head on over to the List Page and click on the Name of the list you want to export. This will open that list for you and then you can simply click on the Export button at the top of the page. You can then use the exported CSV file for a postal campaign mail merge. As you will be sending your marketing to your Contact Lists, you will need to ensure you are removing any Contact that has Unsubscribed - which we've madesuper easy for you. You simply need to add a row at the end of your list (or at the end of each of your 'OR' statements) like the one shown below. The double negative may seem a bit confusing, so its best to say out out loud to yourself before finishing your list, "I want Contacts that are NOT unsubscribed". When a Contact unsubscribes from one of your email campaigns, Campus will automatically change their status to 'Unsubscribed'. However, if you decide to send a campaign to a Contact List that was created before that Contact unsubscribed, you will need to 'Regenerate' the list before re-using it to allow Campus to pull out any unsubscribes. List regeneration also allows Campus to find any Contacts that now need to be included in the in the list. 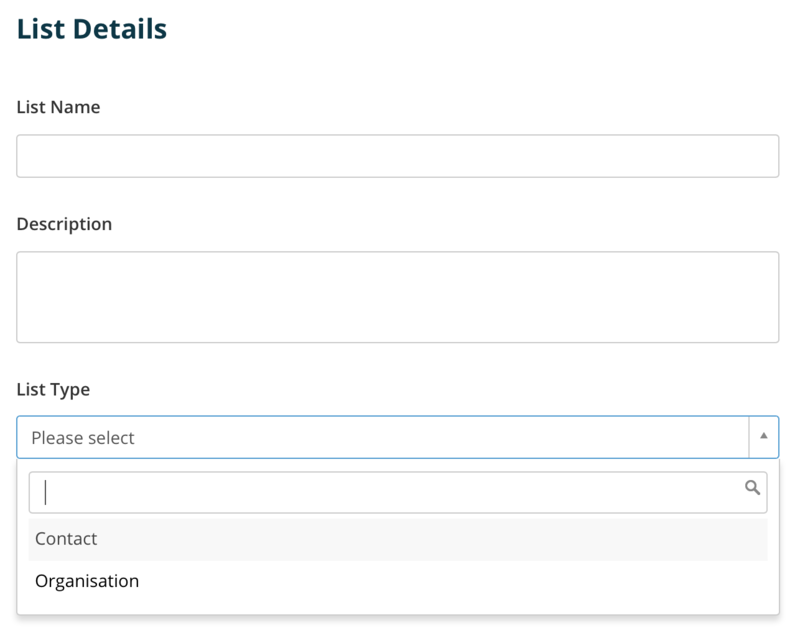 For example - Someone who has filled out a form (after list creation) and chosen a custom field which is incorporated into your lists parameters, will not be included until the list has been regenerated and Campus can retrieve this Contact. Go to your list of lists and hover over the list you want to regenerate. You'll see a button titled Recount appears which if you click will recount the list. Another way to refresh your existing list is by clicking on your list's name. This will allow you to 'View List' where you'll see a button titled Recount List. Click here to recount your list.